Latest research shows that common therapy options for psoriasis can help reduce coronary plaque. In this interview, Dr. Nehal Mehta talks about the study results titled “Immunomodulatory Therapy Reduces Atherosclerotic Plaque Burden by Coronary Computed Tomography Angiography in Psoriasis at One-Year” that was presented at the Society for Cardiovascular Angiography and Interventions (SCAI) 2018 Scientific Sessions. 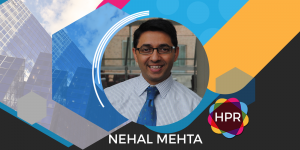 Guest Bio: Dr. Nehal Mehta is the Chief of Inflammation and Cardiometabolic Diseases at the NIH in Bethesda MD. He is also a Professor of Clinical Medicine and an active attending physician in the coronary care unit at George Washington University. 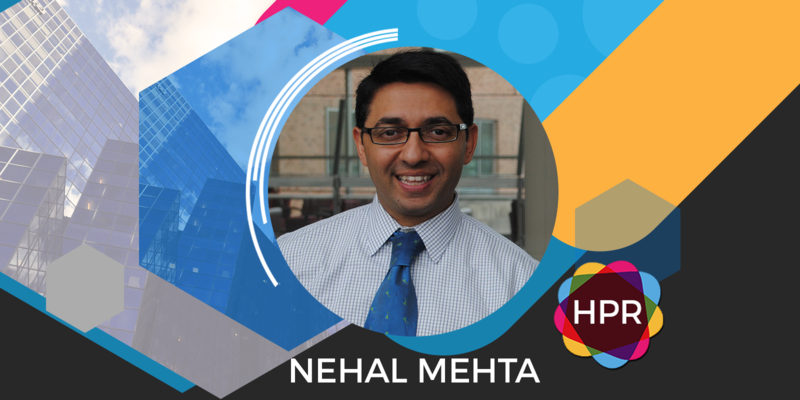 Dr. Mehta is an expert in general cardiology, lipidology, metabolism, and chronic disease effects on dyslipidemia. He has clinical and research interests in moving epidemiological observations into translational studies in humans, studying how inflammation affects insulin resistance, the metabolic syndrome, lipoprotein function, and atherosclerosis. He is a board certified in internal medicine, cardiology, and nuclear cardiology, and he utilizes novel imaging techniques to understand the effect of various exposures on subclinical atherosclerosis. Dr Mehta’s lab discovered that chronic inflammation in the body can be treated to reduce vascular diseases, and he is the PI on five major interventional trials as well as PI on a large cohort study following patients with inflammation over several years to understand the effects on cardiometabolic diseases. Neal Howard: Welcome to Health Professional Radio. I’m your host, Neal Howard. Thank you so much for joining us here today. Our guest is Dr. Nehal Mehta of the National Heart Lung and Blood Institute and he’s joining us here today to talk about a study that was presented at the Society for Cardiovascular Angiography and Interventions 2018 scientific sessions. Welcome to the program, Dr. Mehta. How are you? Dr. Nehal Mehta: I’m great, Neal. Thank you for having me. N: Great. Well, I know that I told our audience that you were with the National Heart Lung and Blood Institute. Give us a brief background about yourself and talk about how you’re involved with the Cardiovascular Angiography and Interventions 2018 scientific sessions. M: Absolutely. So my name is Nehal Mehta. As you’ve said, I’m a preventive cardiologist and a nuclear cardiologist who came to the National Heart Lung and Blood Institute as the inaugural Lasker scholar award which is a program to foster clinical research at the National Institutes of Health. So I came about five years ago as a cardiologist with the goal of understanding inflammation and heart disease and how we might be able to control inflammation in order to mitigate heart disease and my involvement with the SCAI, the Society for Cardiovascular Angiography and Interventions, the involvement was we had submitted original research from our research program asking whether or not we can take coronary artery plaque or hardening of the coronary arteries or the heart arteries and we asked the question if we treat patients with an inflammatory disease, can we make that heart artery disease go away just by treating the inflammation? So we put together this study and we presented it in San Diego just a few weeks ago and really we can kind of dive through any parts of it but that was my involvement with SCAI. N: So as far as that question that was posed, what is the answer? Can we reverse this disease just by treating the inflammation or is there still a long way to go? M: I guess I wouldn’t say a long way to go. If you’d asked me that question about six, I would have said we have a couple decades to go but there’s two things that we should probably talk about so that we’re all on the same page. The first one is there’s been a long line of information that has been shared with a sort of a scientific community that an overactive immune system are having too much of a good thing might actually be bad for lots of disease processes and one of these disease processes is atherosclerosis or hardening of the arteries or the leading cause of heart attack and stroke. So we utilize a model, a human disease they called psoriasis and we use that model disease state to understand what the effect of localized inflammation in the body is on the heart. So the first point everybody should understand is psoriasis is a chronic, common inflammatory skin disease that affects about two percent of the population. It shows up on the skin is red, scaly patches. And once it was just thought to be a cosmetic disease that, “Oh. You should probably not wear short sleeves or you should probably wear a hat because you’re flaking so much from the scalp.”, but over the past decade, our group along collaborators at Penn, Dr. Joel Gelfand have discovered that psoriasis itself just the sheer presence accelerates heart disease. That was our first clue that, “Wait a second. A skin disease is accelerating heart disease.” And so in fact, Neal in 2000 brought that discovery in that program here to the NIH, the National Heart Lung and Blood Institute so that we could start asking. Well, now that we’ve shown that the skin disease accelerates heart attack – “why”. So I’ve spent the past five years trying to figure out why and this SCAI paper was taking these patients with psoriasis and saying if you have severe disease and you qualify for a biologic or an injectable medication that is a monoclonal antibodies that your body will neutralize some of the inflammation, not only does the psoriasis go away but we ask the question, “What if we use pictures of the heart, CT angiography so it’s a non invasive coronary cast? What if we use pictures of the heart to actually follow and track their plaques in their heart?” And now this is where the story gets me. So May of 2017, we published a paper that you could be young 14 years old and you could have psoriasis and it’s severe and you have a 35% chance of having a high-risk plaque in your coronary and you might say, “Well, what’s a high-risk plaque?” A high-risk plaque in the coronary is a part of the coronary artery that is prone to rupture and cause a heart attack. So in 2017, we had this discovery that maybe these extra heart attacks and psoriasis are coming from the coronary arteries. Maybe that’s the reason. That there’s something about systemic inflammation that is driving the coronary artery disease. So what we did was from May of 2017 we then started asking the question in our study, “What if you took a group of patients and you followed them after a year of therapy, would any of these plaques in the coronary arteries change?” It was a small study, Neal, so this is what we call a proof-of-concept study which we took 15 people who were never on this IL-17 therapy on this drug, on this biologic therapy. And we then started following them and this was the inception of the study, that’s not what was presented. Then we started realizing that not everybody goes on that one medication. So then we started looking at anti-TNF therapy commonly known as Humira or a couple others on the market. And we said, “Well, let’s start following them.” And then we started following people. See it’s interesting, Neal, people don’t understand it but there’s a group of people that do not need or want to be treated for their psoriasis. They just choose electively not to be treated and so we followed a group who just said, “You know what I’m just going to live with this for the year.” And we brought them back as well. So we got in a CT angiogram at the beginning and a CT angiogram at the end and we’ve compared what happened to the plaque. This is where it gets superbly exciting, reassuring. We were able to show that the sheer treatment of being, like it didn’t matter what drug – yes or no, if you were at a biologic not only did your skin get better, that’s the no-doubt part but your heart arteries got better. They actually decrease the amount of high risk features in the plaque to a point where one plaque feature in particular – the necrotic core and it sounds very ugly as bird, processes when things in the body die and they create sort of like a hole on the chronic like an ulcer almost. So we found that these necrotic cores which are the ones that rupture and cause heart attack that they actually got better over a one-year period of time and why that is so exceptionally reassuring is that we had a trial not we as me but the field of Cardiology had a trial in August of this past year that was published in the New England Journal of Medicine that showed treatment with a biologic drug if you don’t have psoriasis, if you just have coronary disease not psoriasis, treatment with a biologic drug reduced your second heart attack by 15% just the sheer treatment with an anti-inflammatory biologic drug. So now, I remember when I started this interview I said, well I would have said it’s going to be 20 years but in August we got some reassurance that pure treatment of inflammation with biologic will reduce second events so that’s when this study question arose. We said, “What was it the plaque characteristics? Was it the plaque modulation?” Well in a large outcome study of 15,000 people you cannot get CT angiogram. So it’s just not feasible, it’s not budgeted to do a $3 billion study that was already a billion dollar study. So now, I entered the sort of arena with by saying look as favorable plaque modulation at the coronary level. And that’s what was presented at the SCAI, that in a group of 84 patients there was a reduction in high-risk plaque characteristics following biologic therapy. In my opinion, I think that that is reassuring. It needs to be confirmed in a large properly powered study which is under planning phases now in my group but that’s sort of what the SCAI presentation covered was the fact that one can treat a skin disease which is FDA-approved to be treated with these biologically active medications. And we are just little birdies on the shoulder sort of watching what’s happening to the coronaries. In a way it’s a win-win-win for everybody because the field understands something, the patient now understands something and they’re getting their psoriasis treated. So in my opinion, I really feel that this is one of the more reassuring aspects of the study. N: Where can we go and learn more about the study and about psoriasis as a whole? M: That’s a great question. So there are two resources that I would urge people to access. First of all, there is a group called the National Psoriasis Foundation on which I am a very large supporter. They are a patient advocacy group and you can go to the Psoriasis Foundation’s website by just googling NPF National Psoriasis Foundation and there they will describe, “Okay. So you have psoriasis – what things can you do.” The second is if one already has psoriasis and would like to understand their risk of heart disease, I would urge them to look up my website which is psoriasis.nhlbi.nih.gov. It could be found by just googling my name and it’ll come up under the psoriasis risk program. I would urge people to use this moment to just remember that I am struggling to educate people about this association whether they take therapy or not is not my concern up front. My first concern is people should know that information does, in fact, increase your risk of heart disease and diabetes and by reducing this inflammation, I believe we may have benefits beyond just what you’re reducing the inflammation for but the message would be that’s where we need more ongoing studies. So I would access the NPF website. I would look us up and then if they still have questions, they’re more than welcome to just shoot me an email which is nehal.mehta@nih.gov. I’m always here to help. N: Great. I thank you appreciate your time today, doctor. M: Thank you, Neal. Have a great day. N: You do the same. You’ve been listening to Health Professional Radio. I’m your host, Neal Howard. Transcripts and audio of the program are available at healthprofessionalradio.com.au and also at hpr.fm. Subscribe to our podcast and be sure to visit our affiliates page at hpr.fm and healthprofessionalradio.com.au. Subscribe to our podcast on iTunes, listen in and download at SoundCloud.